Review: "Allocadia is a streamlined platform to manage your marketing budgets"
Allocadia is currently only being used by our corporate marketing teams to manage budgets. It helps to provide greater budget visibility to our finance department and also allows us to not have to rely on spreadsheets to manage our budgets. It is a very intuitive platform to use and this has helped with its adoption in our marketing department. Plan and allocating quarterly budgets. Providing reports on your budget. Generating "MRM" codes to tie our purchase orders in finance to our project codes within our individual team budgets. The wording between the "plan" and "forecast" sections can be confusing at first, as they both imply the same type of activity. Better recovery options for admins if folders are accidentally deleted - had this happen and took a week of manual recreation from an internal admin to get us up and running again. Allocadia is well suited to help teams within a larger department track and manage their budgets, while giving finance and other managers visibility into how budgets are being spent and allocated. It is also easy to customize reports and export them to present to decision makers if needed. At this point in time other business units in my company have not adopted Allocadia. Allocadia Review: "Easy to use, Excellent customer service"
Great for companies that have been using spreadsheets in the past or had used another budgeting system that was very basic and want to be able to do a more detailed analysis of their data. User Review: "An Allocadia Partner's Point-of-View"
We are a certified consulting partner of Allocadia. We help other companies determine if they should use Allocadia, help them prepare to use it, then help them implement and support for the long-run. I look forward to improvements on the approvals engine. The latest release is fantastic, and with a couple more additions, it will be even more robust. I would like to eventually see integrations / adapters to project management (MRM workflow) solutions. Part of controlling marketing cost and improving ROI is measuring and improving the marketing process. Marketers would really benefit from being able to manage process and capacity alongside spend and performance. Review: "Escape "Excel Hell" -- Allocadia is Marketing Performance Management at its Finest"
Allocadia is a terrific way to track your existing budgets in a unified way; even for those companies who are not looking to or are not ready to begin tracking the return on their marketing investment. Allocadia's interface is simple, but its reporting engine is incredibly powerful. Allocadia unifies budgeting, planning, and actual spend tracking within an organization. The Allocadia interface is simple to use and understand, which helps end user adoption. Allocadia contains powerful analytic tools that easily display a visual representation of your data. 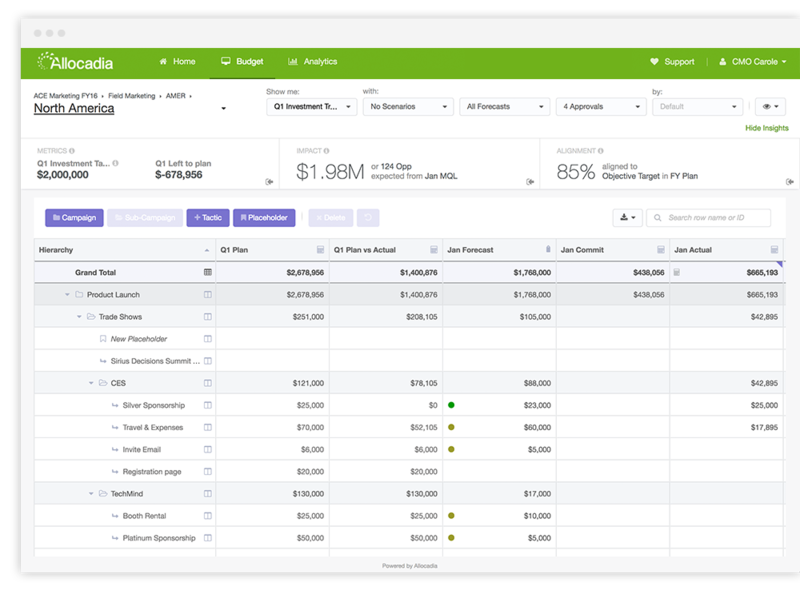 Allocadia is purpose built for marketers, and geared to easily track marketing performance. I would like to see a greater focus on organizational roles via the ability to create user groups, and custom security groups in Allocadia. I look forward to improvements on the approvals engine. If you're looking to improve your company's ability to track marketing ROI, or begin tracking marketing ROI, then look no further. If your organization is not ready to begin tracking ROMI, Allocadia still provides an excellent unified budgeting and planning platform; their "Customer Success Team" will continually work with your organization to help you improve. User Review: "Allocadia instead of an Excel mess"
We are using Allocadia as a Marketing Budget maintenance tool is various departments (Finance, Marketing) and throughout the whole company which is located in different countries in Europe. By using a Excel spreadsheet based solution in the past, we were facing a lot of Excel-related issues incl. deletion of files, changing of past entries, layout and structural issues. Of course that's not what Excel files are supposed to be used for, but we were lacking a proper software solution. Individuality. Allocadia was kind of a start-up when we first got in touch. They adjusted a lot of their functionalities, layout and usability in order to fit our needs. Easy to use. It is very easy to keep control over all the stats while the users take advantage of a nice and easy user interface. Great support. Although we have a time shift of about 10-11 hours (Europe to Canada) we are experiencing a fast, proper and friendly support in any cases. Although the Analytics part is already available it could be improved. So for now Allocadia is very recommended if you are looking for a data maintenance software but less appropriate as a analysis tool. Ask yourself what is it you are looking for (analysis or controlling) and for which purposes (management level or specialists). The costs are very resonable and an absolute Plus! User Review: "Allocadia is our Media Solution"
Allocadia is currently only being used within Media and only has plans to stay that way. We needed a solution that helps us put planning, actuals, POs, and leads in one system and Allocadia was able to help us do all of that. In addition, we've been able to manipulate it to help us fix some other problems as well such as metrics and testing data. Reporting has also been a huge contribution from Allocadia. Allocadia's customer support not just in the setup but as we continue to use it is fantastic. They are fast and very, very helpful. Allocadia was set up to provide my company with as many solutions as possible. We are also given the opportunity to continue to manipulate it within the confines of the structure to make it an even better tool for our department. Because we use Allocadia slightly differently than the typical user, it can be a little clunky for us. However, we have been able to fix almost all issues/problems so that we can use the software in so many more ways than previously imagined. The amount of time it takes to refresh data into their analytics tab can be frustrating. I understand the reasoning behind it but having to wait 5 minutes for it to update so you can pull an accurate report can be tiresome. Anyone who is planning media and needs all of their reporting in one place, this is the software to do that. Out of every software we looked at, this made the most since planning wise. But it also incorporated just about everything you need to do every part of buying down to the actuals and leads. User Review: "Allocadia for Marketing Budgets!" Allocadia was being used by our marketing department within the US and globally. It helped create more accurate reports for analysis. Allocadia is easy to use. Allocadia has a great implementation team that understands the software well. Generating reports was a little slow. I liked that we can create different budget folders for our subsidiaries. Allocadia Review: "Budgeting made easy!" Allocadia is a great tool to quickly understand where you are from a budgeting perspective. Additionally it helps us understand real-time costing all in one view. This helps us understand where we stand at any given time. Speed - it keeps getting faster, but still could be more responsive. Not an issue, but the improvements in the UI are great. You need to have an understanding of the pain points in your budget, so Allocadia can be tailored to fix them. User Review: "Allocadia has it all!" 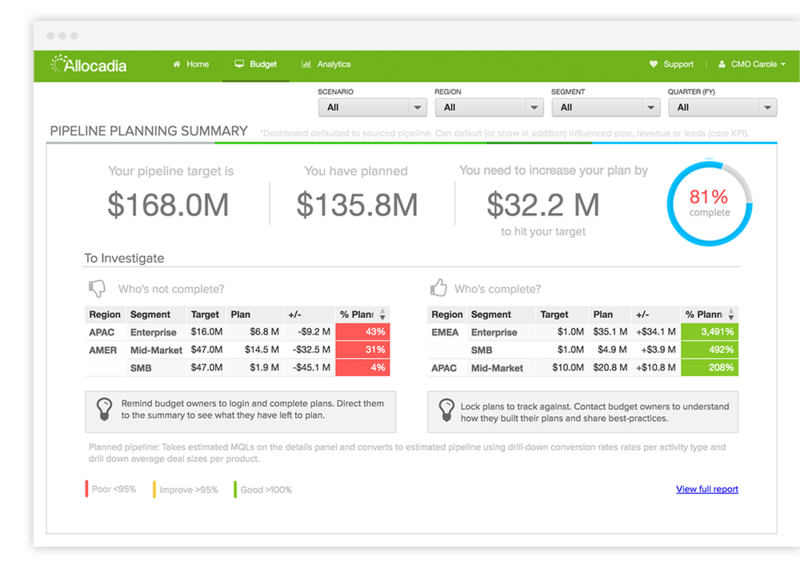 Allocadia is being used to track marketing budgets in our online strategy department. It consolidates budget information that was formerly spread across multiple sources, some of which were individual flat files residing on a variety of systems. It further generates much needed dashboards based on that data, which can easily be used for diagnostic purposes, presentations, or shared directly with partners. Consolidates budget information (planned, allocated, spent, etc.) in a single location. Rolls up and enhances the stored data with custom metrics (calculations) and other conversion processes. Displays data in custom dashboards that really bring the numbers to life. Integration with key data systems such as Google AdWords or Bing Ads. More direct and/or user-friendly data import and export processes (pertaining to raw data and flat files). It is certainly well-suited to an organization with several dozen (or more) marketing campaigns, spread across several channels such as PPC, display marketing and social media. We found it best to work with a single account manager at Allocadia, since there was little information lost and requests could be handled quickly and efficiently. User Review: "Happy with Allocadia"
Our company is using Allocadia for budgeting purposes. Being that we have so many different regions and budgets that we deal with, we use Allocadia to keep all the information organized and up-to-date for our finance team as well as allocation purposes. Mapping invoices with line items. I would allow users to switch items into different budgets vs. having to reenter the item altogether. Allocadia Review: "Excel nightmare no more." Allocadia is currently being used globally by our field marketing department to manage our budget, track spending, and facilitate the approval processes for invoices. Customer experience is key and Allocadia delivers exceptional service. The support team is fantastic and issues are resolved quickly. The drag and drop feature can be a little finicky on the budgets tab. You have to have just the right touch to get something to nest properly. There is a strange glitch sometimes when selecting a vendor in the actuals tab: No matter how many times I'll select a certain vendor from the drop down, it will somehow choose a random different one. It would be cool if the amounts entered into the PO panel could automatically total up and populate the forecast field. We have found great success in using the tool for our approval process. Coding everything in a one-off process was cumbersome and invoices would often not get paid on time. Now, we have streamlined everything on a weekly basis. Allocadia is software designed to make an organization’s marketing planning process more efficient and more strategic. Users can create, collaborate and share marketing plans that align with their company’s priorities. Users can also forecast the ROI from their plans and predict their revenue impact. The solution is cloud-based and helps marketing teams of any size collaborate to create and manage global budgets in any currency without the need for spreadsheets. This solution gives marketing leaders complete visibility into their marketing performance. Allocadia integrates with CRM, finance, and marketing technology systems. The vendor says that their solution offers powerful analytics, so CMOs can get quick and accurate insights into any aspect of marketing — from plans all the way through to revenue.